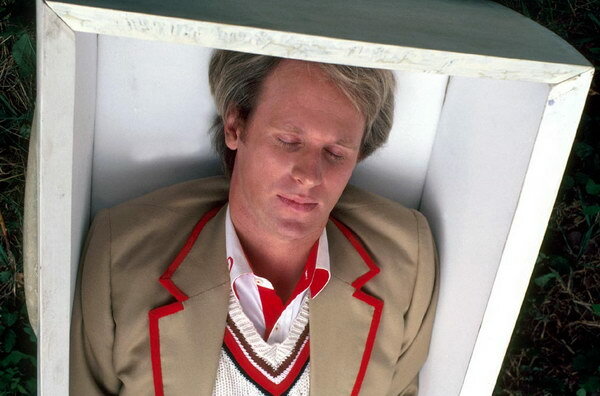 Counting down the 11 5 days to the 50th anniversary, here are my top 11 stories for each Doctor, continuing with 5 (Peter Davison). After the huge success and lengthy run of Tom Baker, the producers of Doctor Who turned to an established star, Peter Davison. 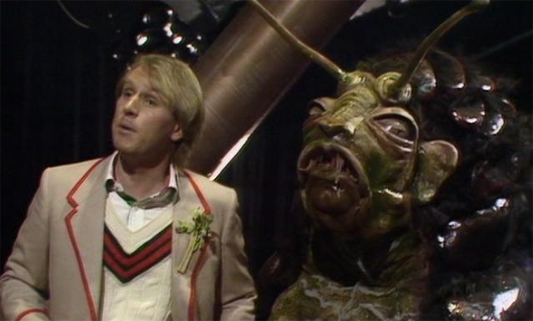 Davison was known for All Creatures Great and Small when he signed a 3-year deal to take over as the Doctor. His portrayal was almost a complete turnaround from Baker’s crazy alien quirks, and though he was the youngest to yet play the part, he portrayed the old man’s soul with great skill. 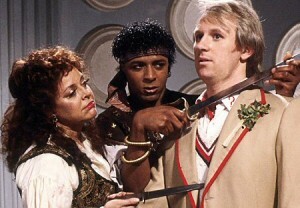 The last story for the 5th Doctor is arguably his best. The Doctor and Peri land on the cave-filled planet, Androzani Minor, that serves as a base for the production of spectrox, a drug made from the bats that inhabit the caves. Spectrox is highly valued on Androzani Major, as it can extend life. But the flow of spectrox is threatened by a masked madman, Sharaz Jek, and his androids. An army sent by the ruthless head of the Sirius Conglomerate, Trau Morgus, who controls the flow of spectrox and other minerals mined on the surrounding planets, is fighting Jek’s androids, unaware that Morgus also supplies guns to Jek for profit. 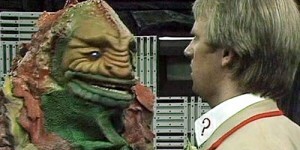 The Doctor and Peri are caught in the middle and eventually contract fatal poisoning from exposure to unrefined spectrox. The only cure lies deep in the caves of Androzani Minor. Adric: Now I’ll never know if I was right. Adric, a young mathematical genius who has been complaining to the Doctor that he isn’t appreciated, proclaims his desire to go home to Terradon, a planet in E-Space (another universe), from which he joined the TARDIS crew in the 4th Doctor story, Full Circle. The Doctor dismisses him out-of-hand, and spends quite a bit of time being annoyed with the boy. Meanwhile, a conference of Galactic powers is planned on Earth to design battle strategies against the Cybermen. The Cybermen plan to explode an anti-matter bomb that will destroy the conference, then attack any survivors with an army hidden on an intergalactic freighter. The Doctor, Adric, Tegan and Nyssa arrive to help thwart the Cybermen, but it is Adric who makes the ultimate sacrifice. Davros: I have waited a long time for this. Once the Doctor is exterminated, I shall build a new race of Daleks. They will be even more deadly and I, Davros, shall be their leader! This time we shall triumph. My Daleks shall once more become the supreme beings! The Doctor, Tegan and Turlough are being dragged down a time corridor and forced to land on 20th century Earth. The corridor runs between an abandoned warehouse in London and a prison ship that holds the shunned Dalek creator, Davros, in suspended animation. The Daleks are trying to break Davros out so that he can find a cure for a virus developed by their enemies, the Movellans. 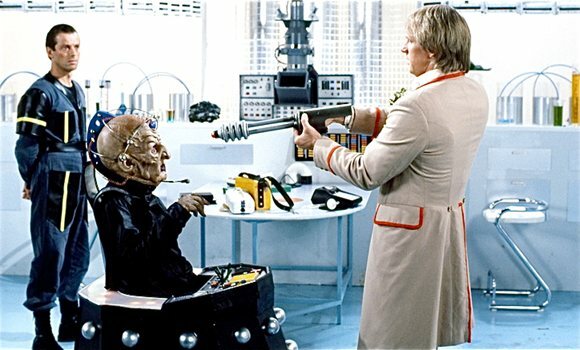 Instead, Davros has a plan to kill off the Daleks that spurned him and create a new race of Daleks under his control (and a side plan to clone the Doctor and have the clone infiltrate and assassinate the High Council of Time Lords). A man is the sum of his memories. A Time Lord even more so. The 20th anniversary of the show brought together three of the original five actors, plus a stand-in for the late William Hartnell. Tom Baker, who had just left the role, decided not to participate, so previously unused footage of him and Romana was used to explain their absence. Meanwhile, the rest of the Doctors and several companions, including Tegan, Turlough, Sarah Jane, Brigadier Lethbridge-Stewart, and Susan, are swooped up by a mysterious cone of energy and placed at different points in the Death Zone on Gallifrey and pitted against various enemies, including a Dalek, Cybermen, Yeti, and a Raston Warrior Robot. The Master is summoned by the Council of Time Lords to enter the Death Zone and help the Doctor, as whoever is behind this is also draining the Eye of Harmony, threatening all of Gallifrey. 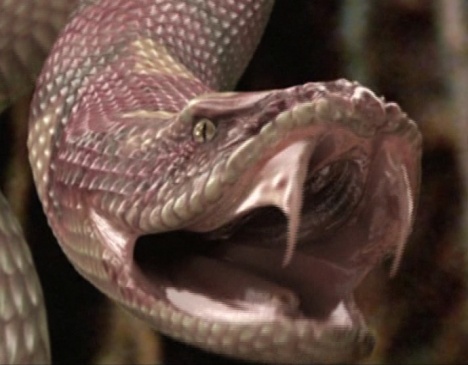 With the help of the Master, the Doctors reach the Dark Tower at the center of the Death Zone and find the Tomb of Rassilon, wherein supposedly lies the secret of eternal life. That’s the trouble with regeneration: you never quite know what you’re going to get. Carrying on from the previous story in which a fall from the top of the radio antenna of the Pharos Project critically injured the Doctor to the point of regeneration, arriving authorities put the unconscious Doctor in an ambulance and intend on taking him and his companions into custody. Adric distracts them with a story about being aliens arrived to answer the project’s call, and Nyssa and Tegan steal the ambulance and take the Doctor back to the TARDIS. Once inside, the Doctor heads straight into the corridors looking for the Zero Room–a space completely cut off from the rest of the universe that will give him a chance to stabilize his erratic regeneration. The Master appears and stuns all the guards and Adric. Nyssa and Tegan rush to help Adric, who comes to life long enough to set some coordinates on the TARDIS console and also head for the Zero Room. As it turns out, this Adric is a computational simulation and the real one is held hostage by the Master. The TARDIS has been set on a course toward the Big Bang, and only a last minute attempt by Tegan seems to change their course to the idyllic planet, Castrovalva. These creatures have vast powers, that’s why none of them must win. To achieve further power would be a disaster. Sailing ships from different eras in Earth’s history are found racing around the solar system. The TARDIS materializes in the hold of an Edwardian naval vessel whose crew has no idea how they arrived. Meanwhile, the Doctor’s companion, Turlough, has been secretly working for the Black Guardian in exchange for his freedom as a political exile from his home planet, Trion. The Guardians of Time (which included the Black and White Guardians) set up the race for a group of Eternals, powerful beings that exist outside of Time, with the prize being Enlightenment–which would grant them their hearts desire. The Eternals created the ships and kidnapped the crews to run them. Black Guardian: We haven’t much longer. I need to know that I have your assent to our arrangement. You will find me the most accommodating of partners. Vislor Turlough: But, Murder. I’m not sure I could go that far. In 1983, Brigadier Lethbridge-Stewart is retired from UNIT and teaches mathematics at Brendon Public School. A mischievous student, Turlough, convinces his classmate to steal the Brigadier’s antique car for a joyride, and they veer off the road and crash. 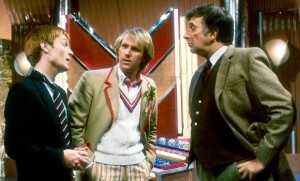 While unconscious, Turlough is contacted by the Black Guardian. The Black Guardian knows Turlough is actually a political prisoner from another planet. He offers Turlough transportation off Earth if he will kill the Doctor. Meanwhile, the Doctor, Tegan and Nyssa are caught in a warp ellipse on a starliner. Turlough uses a transmat from the Black Guardian to appear on the starliner, and he escapes with the Doctor. 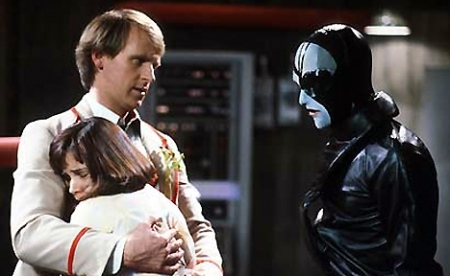 Tegan and Nyssa are sent to 1977 where they meet an earlier version of the Brigadier, and an alien scientist called Mawdryn who pretends to be a failed regeneration of the Doctor. In reality, he has been conducting experiments to try and discover the secret of Time Lord regeneration, creating mutated monsters instead. An apple a day keeps the… Ah, never mind. The TARDIS visits the jungle planet Deva Loka. While Nyssa remains behind in the ship to recover from a mild mental disorientation, the Doctor, Tegan and Adric explore. Tegan falls asleep under some wind chimes and becomes possessed by an evil force, a Mara, a being that dwells in the dark places of dreams. It manifests itself here as a huge snake. I’m not helping you, officially. And if anyone happens to ask whether I made any material difference to the welfare of this planet, you can tell them I came and went like a summer cloud. Frontios is one of the last human outposts in the far future. 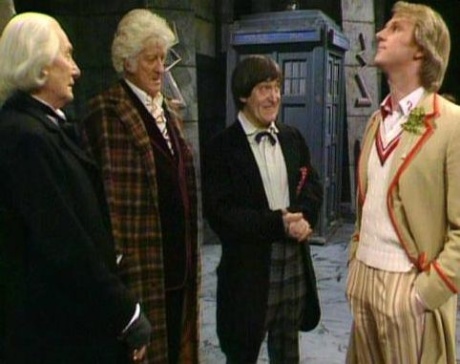 But since it is a colony that is just starting out, it is forbidden for a Time Lord to meddle in its affairs. But a violent meteor storm appears to destroy the TARDIS, and when it is discovered that a tachnologically advanced race of insectoid aliens is living beneath the surface, the Doctor attempts the get them to repair his lost ship. I’ve never been able to reconcile the Terileptil’s love of art and beauty with their love of war. The Doctor tries to take Tegan back to Heathrow Airport, but they arrive 300 years early. They find that three alien Terileptil fugitives have crash landed and are planning on wiping out all life on earth with a modified version of the Black Plague. Why do I always let my curiosity get the better of me? The TARDIS lands in rural England in 1925 where the Doctor is mistaken for an aristocrat and thrown into a game of cricket. Later, he and his companions are invited to a fancy dress ball at the Cranleigh Estate where stranger murders begin to occur.